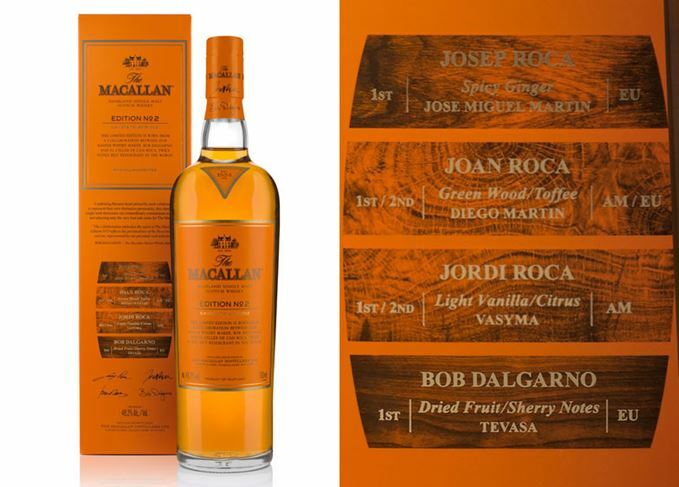 Speyside single malt Macallan has launched Edition No 2, a limited release whisky designed to mark its partnership with celebrated Catalan restaurant El Celler de Can Roca. The new, no age statement (NAS) malt combines whiskies matured in seven different cask types from four Sherry bodegas: Tevesa, Diego Martin, Jose Miguel Martin and Vasyma. The aim of the whisky is to reflect the ‘creative spirit’ of the four collaborators, who are Macallan master whisky maker Bob Dalgarno and Joan, Josep and Jordi Roca – brothers and founders of El Celler de Can Roca in Girona, Spain, twice voted best restaurant in the world. Each member of the quartet chose a total of seven different cask types, which Macallan believes contributes up to 80% of the final whisky’s character. Dalgarno picked European oak casks from Tevasa, El Celler de Can Roca head chef Joan Roca chose American and European oak casks from Diego Martin, restaurant sommelier Josep Roca selected European oak casks from Jose Miguel Martin, and pastry chef Jordi Roca went for American oak butts and puncheons from Vasyma. ‘The driving force behind the Edition Series is the freedom we have to explore different and distinctive casks, some that might not typically be used in other Macallan whiskies,’ said Dalgarno. Bottled at 48.2% abv, Macallan Edition No 2 has a UK RRP of £65.